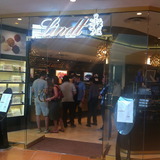 Melbourne now (and now equal to Sydney) has their fourth Lindt Chocolat Cafe store open. Number four just opened at the Southgate complex today at the time of writing this, and there are a few celebrations; although minor - it was great to be able to pop in and take a look, even though the outdoor seating area is not ready and open to their customers as yet. Vouchers for a 'buy one get one free drink' were being handed out today at random (these are handy to keep as their drinks are $7 a pop) with a yummy Lindt Lindor ball. The pick and mix selection is so tempting, however when you add up the sums, you would be better off to buy some Lindt chocolate at any supermarket that sells them. It was busy and there was a huge turnout; it was almost challenging to walk around. I had their normal milk iced chocolate, divine as usual, and there were free ice cream sample tastings going on as well. For $7 a scoop, it does appear to be on the pricey end (you might be better off heading to nearby Baci or Calatrava, depending on how you feel about this) however the scoop is rather heavy, yet indulgent; something would be wrong with you if you were hungry afterwards. Got to sample the Duo flavour (a lighter, crunchier chocolate) however the black forest flavour got my fancy. Watch out, the latter flavoured ice cream is extremely strong and leaves a dark chocolate bitter aftertaste in your mouth. Otherwise great service and quite well organised, although it is one of their smaller stores. It will be great when the outdoor seating comes alive. Why? A great establishment to have a drink with a friend.